Property taxes affect everyone, not just homeowners. Even if you rent your home, the amount of rent you pay is affected by the property taxes your landlord pays on the building. Here are the ten states with the lowest property taxes in the United States. All effective tax rates are courtesy of the Tax Foundation while home values and household income figures are drawn from U.S. Census reports. The good news is that Hawaiians enjoy the cheapest property tax rate in the US, with an effective rate of 0.28%. The bad news is that because housing is so expensive (the median home value in Hawaii is $515,300), that can still come to a hefty tax bill. With a median household income of $69,515, the hypothetical median Hawaiian household is paying about 2% of its income in property taxes. Residents of Alabama benefit from a combination of a 0.43% property tax rate and a low median home value of $125,500. The median household income for the state is $43,623, so property taxes make up just 1.2% of household income. Alabama has the lowest percentage of income going to property tax of all the states on this list. With an effective property tax rate of 0.51% and a median home value of $144,100, residents of Louisiana get a pretty good deal. Median household income is $45,047, so property taxes for residents with income at the median come out to 1.6% of household income. Delaware's effective property tax rate of 0.55% lands them in the fourth spot for states with the lowest property taxes. The median home value of $231,500 is a bit above average, though. The state's median household income of $60,509 puts property taxes at 2.1% of household income. It's not technically a state, but D.C.'s residents still pay property taxes. They benefit from a low effective tax rate of 0.57%. However, D.C. has a steep median home value of $475,800. Even though the area has a fairly high median household income of $70,848, property taxes come in at a daunting 3.8% of that amount. Like D.C., South Carolina has an effective property tax rate of 0.57%. However, the state's much lower median home value of $139,900 and median household income of $45,483 sets the median property taxes at just 1.7% of household income. "Almost heaven" or not, West Virginia does offer residents a low effective property tax rate of 0.59%. With a median home value of just $103,800 and a median household income of $41,751, West Virginians pay a mere 1.5% of their household income in property taxes. Moving on over to the western U.S., Wyoming has an effective property tax rate of 0.61%. The slightly above-average median home value of $194,800 and median household income of $58,840 put property taxes for Wyoming residents at 2% of household income. 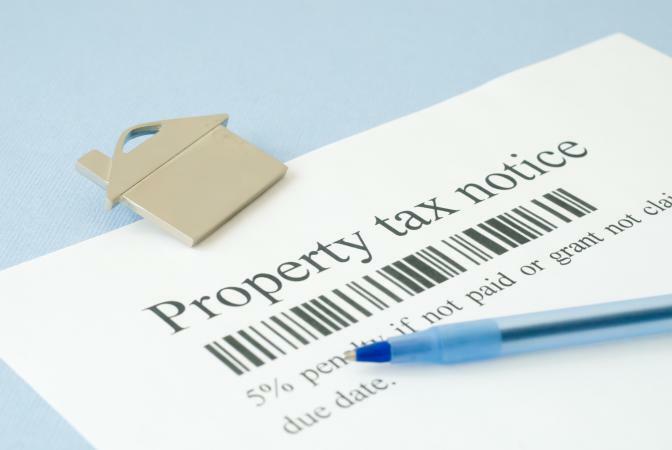 Wyoming's neighboring state of Colorado also has an effective property tax rate of 0.61%. The state has a median home value of $247,800 and a median household income of $60,629, so property taxes make up 2.5% of household income for Colorado residents. The final mention goes to Arkansas, where residents pay an effective property tax rate of 0.62%. The low median home value of $111,400 and median household income of $41,371 put property taxes for the state at just 1.7% of household income. Clearly, property tax rates aren't the only factor in deciding how high property taxes will be. A very low rate combined with a very high home value can still result in an unpleasantly high bill come tax time. Still, all of the above states keep property taxes to a fairly low level. For perspective, consider the state of New Jersey, whose high property tax rates and home values result in a property tax bill of 10.4% of median household income! All in all, property tax rates are something to consider if you're thinking about buying a home or moving to a new state.